My sister and her husband showered me with chocolate this Christmas, including this pretty Mindo Chocolate bar. Mindo is a single origin chocolate company that operates out of Ecuador and Michigan. Take a look at that ingredients list - just the good stuff. The Cinnamon Rustic bar is a dark chocolate bar (the percentage isn't given, but everything on Mindo's website seems to be either 67 or 77%) with a pretty cinnamon/white chocolate garnish in the center. 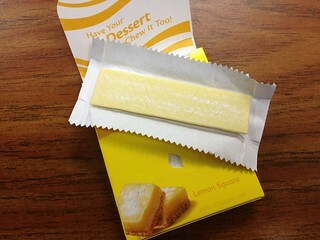 The bars were also given a lovely dusting of demerera sugar. The chocolate smelled of cinnamon and dark-roasted coffee beans, and it tasted very fruity with just a bit of acidity (almost like a raspberry). 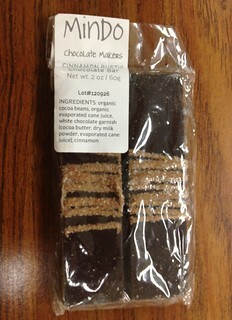 I'm not sure if there was any cinnamon in the bulk chocolate, but I couldn't taste it. The drizzle was sweet and creamy with a mildly spicy cinnamon flavor. Cinnamon can be overpowering, but I wish the cinnamon had been a little stronger, or that the drizzle had been uniform across the whole bar (it looks better on the website). The bar had an interesting texture. 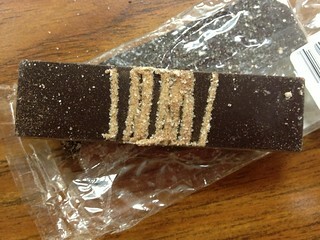 There were sugar crystals throughout the chocolate that gave it a grainy crunch (in a good way - maybe that's what makes it "rustic"). The bar itself had a nice snap and a smooth melt. It had a clean finish with no stickiness or lingering aftertaste. The bites that had both drizzle and chocolate were the best; I just wish there had been more of those bites. A few months ago, vending machines were installed in my office building. Again. When I first started there 5 years ago, there were dubious vending machines in a forgotten corridor of the building. Rumor has it that they contained sandwiches, but I can't confirm that (even though I bought one once). This time, no one was about to mess around with sandwiches. The new vending machines have chips and candy, and they're doing pretty well. My curiosity got the better of me yesterday, so I branched out and bought this 2 pack of AVI cookies. 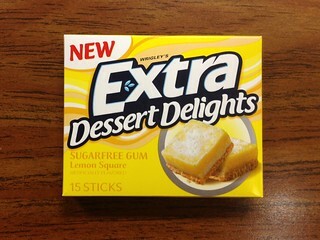 The package had no nutrition information, but it did have a very long list of ingredients. The cookies had a surprisingly strong cocoa scent that reminded me of chocolate fudge. They were soft and chewy, and the little chocolate chips melted away into the bulk of the cookie, making it a bit richer. 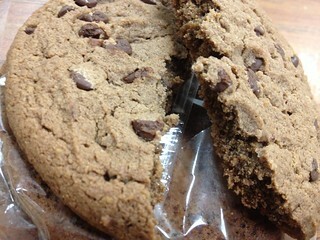 The cookie itself had a very fine, sugar-like grit to it that made it seem more like a brownie. Even though it was a really sweet cookie, there was just a hint of saltiness to keep the sugar in check. It killed my chocolate craving, but the portion size was just too large. 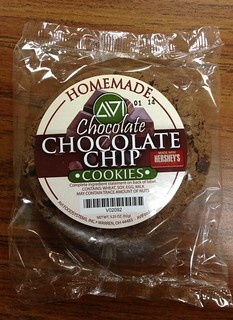 According to the AVI website, one cookie is 270 calories, and there are two cookies in the bag. Furthermore, as Rodzilla of Rodzilla Reviews pointed out, each cookie also has 3 grams of trans fat, which is more than I really want to get from a cookie (especially one that already has a decent amount of saturated fat). After the media blowout several years back, many companies minimized their usage of trans fats, and I can't remember the last time I saw a non-negligible quanitiy listed on a label (for example, I didn't even think to check these cookies for trans fat). I won't lie - the cookie was pretty good, but I wouldn't pick it again. Happy New Year! On the first day of 2013, I got the flu. As luck would have it, I also ran out of scheduled reviews. Adding insult to injury, my order from NapaJapan arrived while I was buried beneath a mountain of blankets, cough drops, and lotion tissues. The box, jam-packed with Tirol chocolates and matcha-flavored treats, stared at me for days, taunting me. Now that I can taste and enjoy food again, it's time to dive in! 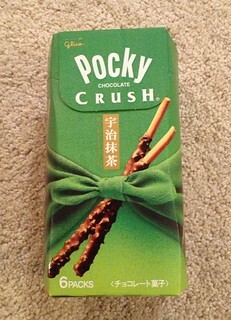 I'll start with Uji Matcha Chocolate Crush Pocky. The city of Uji (near Kyoto, Japan) is home to many beautiful temples and shrines, The Tale of Genji Museum, and it's famous for matcha, so it's a great place to visit if you're in the area. During a brief visit to Uji in 2009, I had the most delicious chadango and matcha ice cream of my life. Next time, I'll try to get there before all the historical sites close. 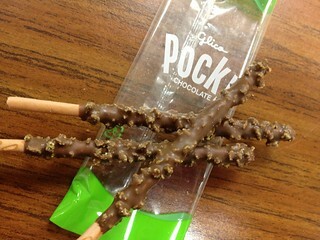 In this flavor, an azuki (red bean) Pocky stick was coated in matcha cookie bits, then dipped in milk chocolate. All I could smell was the milk chocolate, so I was a bit worried it would overpower the matcha flavor (most of the matcha chocolate snacks I've tried use white chocolate). I was right; the matcha was there, but it was very subtle. The stick didn't taste like azuki at all, but it was pink. 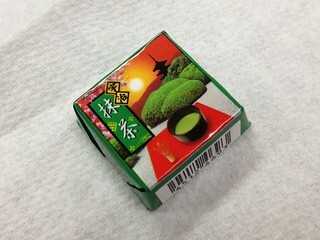 The matcha cookies were crispy and light, easy to pick out from the denser, cracker-like crunch of the stick . The combination of textures was fun. Neither the cookies nor the stick were very sweet, so the sweetness of the milk chocolate was balanced nicely. 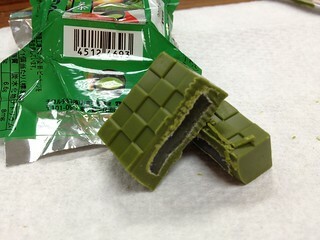 Although I would have liked more matcha flavor (let's face it - I always want more matcha), milk chocolate with a hint of matcha is pretty tasty.